The first human H7N9 avian influenza cases occurred in China in early 2013. 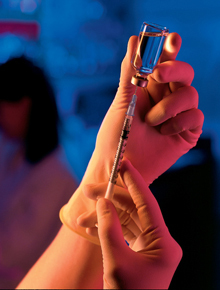 A large, NIH-sponsored clinical trial of an experimental H7N9 avian influenza vaccine found an immune response that was believed to be protective in 59 percent of study participants who received two injections of the inactivated vaccine at the lowest dosage tested when mixed with an adjuvant – a component that boosts the body’s immune response and enhances the effectiveness of inactivated influenza vaccines. Participants who received a vaccine without the adjuvant had a minimal immune response. The results are published in the Journal of the American Medical Association (JAMA). The randomized, double-blinded clinical trial, sponsored by the National Institute of Allergy and Infectious Diseases (NIAID), enrolled 700 healthy adults ages 19 to 64 at four NIAID-sponsored Vaccine and Treatment Evaluation Units (VTEUs) in the United States. Enrollment began in Sept. 2013 and six-month followup was completed in May 2014. The clinical trial was led by Mark Mulligan, MD, professor of medicine at Emory University School of Medicine and principal investigator of the Emory VTEU. The Emory study site included the Hope Clinic of the Emory Vaccine Center, the Emory Department of Pediatrics and Children’s Healthcare of Atlanta. The paper’s Emory co-authors were Evan Anderson, MD, Srilatha Edupuganti, MD, Nadine Rouphael, MD and Paul Spearman, MD. The 700 volunteers were divided into groups receiving four different dosages of vaccine, with or without adjuvant (MF59), given at 0 and 21 days. Those receiving vaccine without adjuvant had minimal immune responses, even at the highest vaccine dose. Likely immune responses were assessed at 42 days after the first vaccination with a standard blood test called the hemagglutination (HAI) antibody assay. No serious adverse events were reported, and side effects were mild. Antibody responses were not significantly different between participants who received the highest and the lowest dosages of vaccine along with two doses of adjuvant. But participants who received a dose of adjuvant with their first dose of vaccine had immune responses comparable to those who received two doses of adjuvant. This finding could be important in stretching supplies of vaccine and adjuvant during a pandemic. Participants who recently had received a seasonal flu vaccination or those who were older were less likely to have a strong immune response. "This clinical trial gave us valuable information about the use of H7N9 flu vaccine combined with adjuvant and makes us better prepared for a potential pandemic," says Mulligan. "We must continue to test and improve vaccines for all flu strains, as these viruses have the ability to mutate and spread rapidly." The first human H7N9 avian influenza cases occurred in China in early 2013. Most infected people have had contact with infected poultry. Although the virus does not sicken birds, approximately 67 percent of infected people have required hospitalization. As of Sept. 4, 2014, 452 cases and 166 deaths (37 percent) had been reported to the World Health Organization. Other VTEUs participating in the clinical trial were at Cincinnati Children’s Hospital and Medical Center; University of Iowa, Iowa City; and University of Texas Medical Branch, Galveston. The vaccine and adjuvant were supplied by the U.S. Department of Health and Human Services Biomedical Advanced Research and Development Authority (BARDA) from its National Pre-pandemic Influenza Vaccine Stockpile. Additional details about the clinical trial are available at www.clinicaltrials.gov, identifier NCT01938742.